We have carved a niche for ourselves as a proficient Manufacturer, Exporter and Supplier of Mild Steel Rubber Lined Pipes from Maharashtra, India. Designed and fabricated in accordance with the predefined industry standards, our Mild Steel Rubber Lined Pipes assure long functional life. 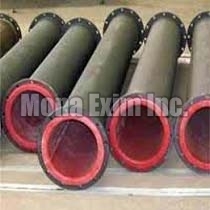 The Pipes are extensively in demand owing to their resistance against corrosion and abrasion. The Mild Steel Rubber Lined Pipes are obtainable at minimal prices.